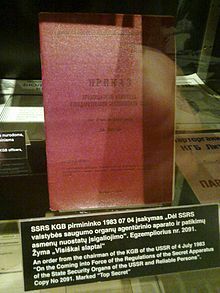 The KGB (Russian: Комите́т Госуда́рственной Безопа́сности (КГБ), tr. Komitet Gosudarstvennoy Bezopasnosti, IPA: [kəmʲɪˈtʲet ɡəsʊˈdarstvʲɪnːəj bʲɪzɐˈpasnəsʲtʲɪ] ( listen)), translated in English as Committee for State Security, was the main security agency for the Soviet Union from 1954 until its break-up in 1991. 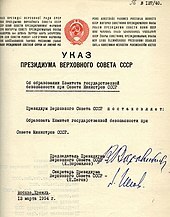 As a direct successor of preceding agencies such as Cheka, NKGB, NKVD and MGB, the committee was attached to the Council of Ministers. It was the chief government agency of "union-republican jurisdiction", acting as internal security, intelligence and secret police. 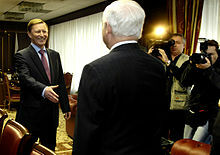 Similar agencies were constituted in each of the republics of the Soviet Union aside from Russia, and consisted of many ministries, state committees and state commissions. Recruitment then emphasised mercenary agents, an approach especially successful[quantify] in scientific and technical espionage, since private industry practised lax internal security, unlike the US Government. One notable KGB success occurred in 1967,with the walk-in recruitment of US Navy Chief Warrant Officer John Anthony Walker. Over eighteen years, Walker enabled Soviet Intelligence to decipher some one million US Navy messages, and track the US Navy. The centre then realized that it was better for them to deal with a more competent agent, which at the time was Babrak Karmal, who later accused Nur Muhammad Taraki of taking bribes and even of having secretly contacted the United States embassy in Kabul. On that, the centre again refused to listen and instructed him to take a position in the Kabul residency by 1974. On 30 April 1978, Taraki, despite being cut off from any support, led the coup which later became known as Saur Revolution, and became the country's President, with Hafizullah Amin as Deputy-Prime Minister and Vice-President. 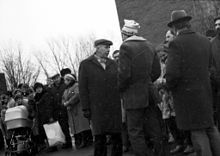 On 5 December 1978, Taraki compared the April revolt to the Russian Revolution, which struck[clarification needed] Vladimir Kryuchkov, the FCD chief of that time.